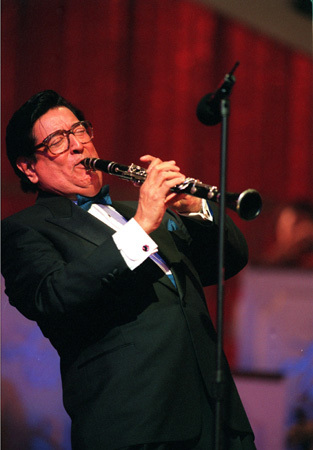 Henry Cuesta played the clarinet for Lawrence Welk from 1972 to 1982. Cuesta was the son of Miguel Cuesta, a classical violinist and music teacher who taught his son the violin for seven years. Cuesta's cousin, Ernie Cacer, a top baritone saxophonist and clarinetist with the Glenn Miller Orchestra, encouraged Cuesta to switch to the clarinet, however. Cuesta proved himself a gifted prodigy of his clarinet idols, Benny Goodman and Artie Shaw, and was selected to play with the Corpus Christi Symphony Orchestra in Texas while still in high school. Before being drafted into the Army in 1952, Cuesta graduated from Del Mar College where he majored in music. In the Special Services branch of the Army, he was involved in entertaining troops in Europe and England (including a Tribute to Gershwin concert with the Stuttgart Symphony Orchestra). After his Army duty, Cuesta toured the United States and Canada, developing his own highly personal style. While living in Toronto, Cuesta and his group became the Mecca for visiting musicians, including Benny Goodman on one occasion. After the departure of the Lawrence Welk clarinetist, Peanuts Hucko, Bobby Hackett advised him to call Lawrence Welk about a job opening. After listening to his recordings, Welk hired him over the phone in 1972. Cuesta made countless personal appearances performing and conducting in jazz festivals, state and county fairs, conventions, supper clubs, symphony pops concerts, etc. He appeared as a soloist with Jack Teagarden, Bob Crosby, Mel Torme, in a Bobby Vinton TV special, on the Tonight Show starring Johnny Carson, in addition to the ten years on the Lawrence Welk Show. Two of Cuesta's perrenial favorite song requests were Benny Goodman and Louis Prima's 1935 hit song "Sing, Sing, Sing" and "Rhapsody In Blue." Tragically, Cuesta's only son died in 1987 during a robbery at the Wilshire Mann theater he worked at in Los Angeles. The case remains open as a cold case. Cuesta died December 17, 2003 at the age of 71 at his home in Sherman Oaks, CA.